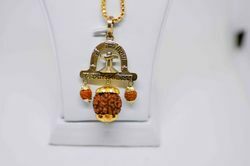 Pioneers in the industry, we offer 1 mukhi rudraksha natural brown beads, designer rhodium gold plated pendant, har har mahadev kavach, 5 face rudraksha damru kavach, om trishul pendant and 5 mukhi rudraksh sinks in water from India. 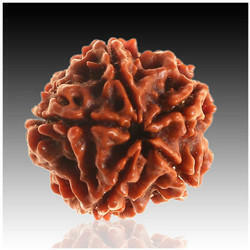 Ek Mukhi Rudraksha in a Laboratory Tested Certified Casing . 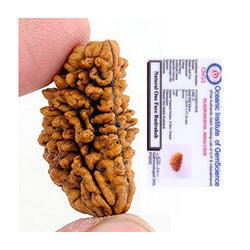 Please check before buying that you are buying from the seller "Himalaya Rudraksha Kendra " as other sellers might give you product different from product shown on page. 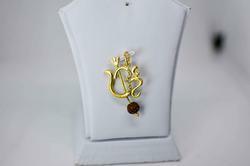 Pendant has om design with 5 mukhi Rudraksha in it. This Piece of jewellery comes with Parure assurance of Quality and Durability. It enhances your concentration power. This Accessory Will Enhance Your Spiritual Power, Wealth, And Will Help You to Overcome Your Fears. 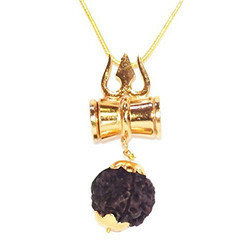 Om Trishul Pendant piece have rudraksha below the pendant, studded zircon stones in the center and is carved in shape of Om having trishul passing through it. The Accessory: Spiritual Saga OM with Trishul pendant with gold plating. How to Wear it: The pendant can be worn with a Kurta-Pyjama set. Own the Part: Best for the festive and auspicious ceremony. To make your accessories last longer avoid harsh chemicals and moisture. Keep dry, clean with dry cloth and wear with panache. A line of handcrafted accessories for the modern Indian Men & Women. "